It was a Lucasfilm reunion as I ran into dear friends I worked with seventeen years ago at ILM like Joel Aron and Lorne Peterson. I dressed up as “Summer Leia”, a summer take on the Classic Leia costume, due to Dagobah-like temperatures. People sported the most amazing costumes, some taking three years to make! My favorite costume was made by this young chap named Adam who went as Yoda, with a paper mache Yoda helmet, green tee-shirt and burgundy bathrobe. 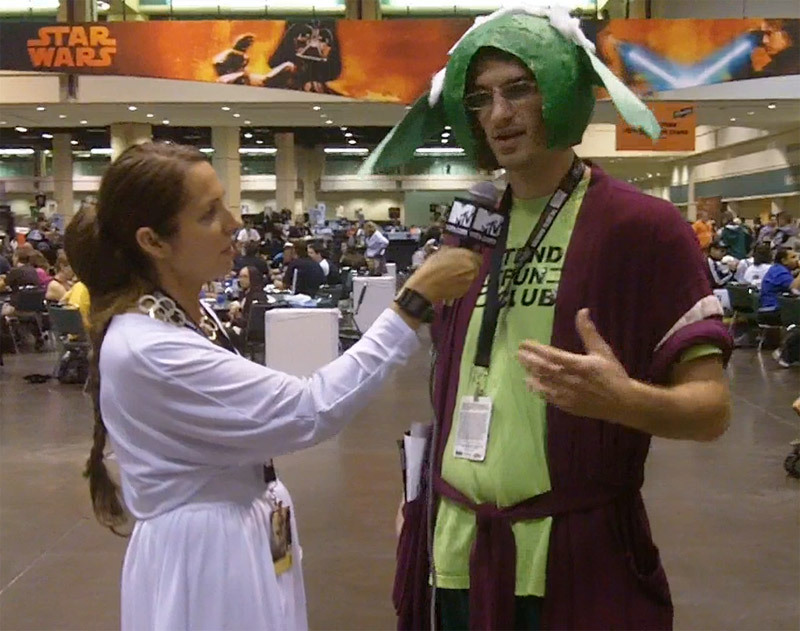 He was more like a cross between Yoda and Hugh Hefner but nonetheless priceless. – Seeing Anthony Daniels each morning as he snuck into the club floor breakfast to take away his tea and biscuits. – Mark Hamill at our hotel bar, my mom and sister just froze, classic. As far as the highlight of the convention? I can say, without a doubt, seeing how insanely excited the fans get; Mark Hamill refers to them as UPF’s, the ultra-passionate fans. This was most widely witnessed in the digital theatre where they screened both Empire Strikes Back and Return of the Jedi. Mom and I sat down with our popcorn as the lights went down and the legendary opening scrawl came up on the screen. The crowd went wild, yelling at the humongous digital screen “Nooooooooooo! That’s your brother!” when Leia lays a wet one on Luke’s lips in ESB. Every time a light saber ignited on screen, those in the crowd with them ignited theirs as well. It was just like a Star Wars version of the midnight Rocky Horror Picture Show. It brought back memories of the first time I saw Star Wars in Ventura County when I was eight with my dad. He dragged my sister and me unwillingly to the film but when we came out we were bouncing with galactic gratification. I took a look around the audience as tears welled up inside, realizing how incredibly lucky I was to have worked for the man in plaid — George Lucas. And to George I say this – thank you for not firing me when I approached you in my drunken and possibly slurry state at the 1993 Lucasfilm holiday party, limping because a large piece of sourdough was, unbeknownst to me, stuck on my stiletto heel. I am forever your Slave Leia. This entry was posted in Star Wars and tagged Carrie Fisher, Industrial Light + Magic, Lucasfilm, Mark Hamill, MTV Geek, Star Wars Celebration by laurel. Bookmark the permalink. Love the sourdough in the stilletto! And your comic genius is highlighted in this piece. Bravo! You are just freakin’ hilarious.